Trash To Couture: DIY ruched maxi skirt. 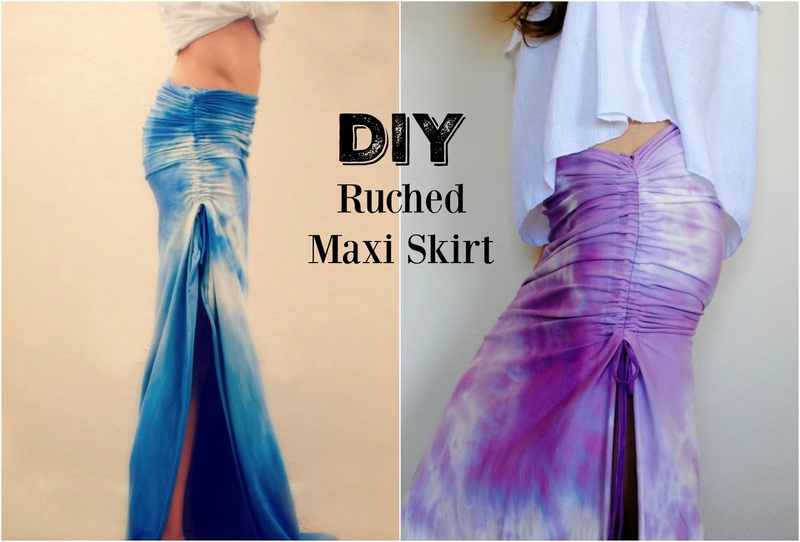 Nothing says summer like a tie dyed maxi skirt, perfect for a swim cover up and comfortable as can be. It may still be cold but warm weather is on the way! What I love about this skirt is the flattering fit from the ruched split seam. The fabric I used is from Organic Cotton Plus. It has a nice stretch, soft texture, and isn't see through. It's made from 95% organic cotton so it dyes beautifully. Try their dyes options as well. I've used their indigo and Procion. Check out the full tutorial in the video below. I love the ruching this split seam gives to my maxi skirts. This technique is great for skirts, sides of shirts, sleeves, and more. For the maxi skirt, you will want the split seam to be 20 inches. So measure from the waist to 20 inches down and mark or pin. You will do the below technique for that 20 inches only. Begin by placing the side right sides together, fold over 1 inch on both sides. Finishing the edges is entirely up to you. With knit you can simply leave the edges unhemmed. I prefer this method because then it doesn't create waves when doing a conventional hem. A serger with a rolled hem is another great option if you have access to one. Love it, how do you gather the side seams though, I've never done this? Thanks that sounds too simple, wonder if ill be able to manage it lol! Love how this turned out. Maxi skirts are so much better with huge side splits. Looks great!! and I love the hand dyed fabric. It really turned out beautifully! Oooo! I can't WAIT to make one of these! Thanks for sharing! This IS a summer staple. I really want more maxis in my wardrobe! Do you just gather the extra 5 inches that you added to the overall length for the ruching or what? How much do you gather to make the ruching? LOVE this! Can't wait to make a few for summer!! Thanks for the inspiration! I think I'll round off my corners though, at the bottom of the split by the hem for a softer look. Must have for my Miami trip ;) love it! Hi! Just 2 question: Is this just cotton fabric? I would prefer to just buy at my local fabric store. Also, did you just sew on the tie at the end of the ruching? war can i find the video?? I just have a quick question. Do you do anything special to the waist? Do you hem it, or leave the edges raw? Also, do you just make sure it is snug enough by using your measurements? I absolutely loooovvvveee this and my teenagers are asking me to make one for them. I just made it fit my measurements, maybe do the waist measurement minus an inch and it should be snug enough around the waist. Try a twin stretch needle and "woolly nylon"(try amazon if you can't find it at your local store) on the bobbin normal cotton on top for a super easy and flat hem!!! sigh... I don't have a sewing machine, so not even gonna attempt. Wish I could though! Really cute!